CORPUS CHRISTI, TX – Solid Waste Services has introduced the fourth character in its Recycle Right campaign. Drastic Plastic, also known as the plastic bag, is another least-wanted offender in The Recycling Bin’s Dirty Dozen and will be used to teach the public about the correct way to recycle plastic bags. 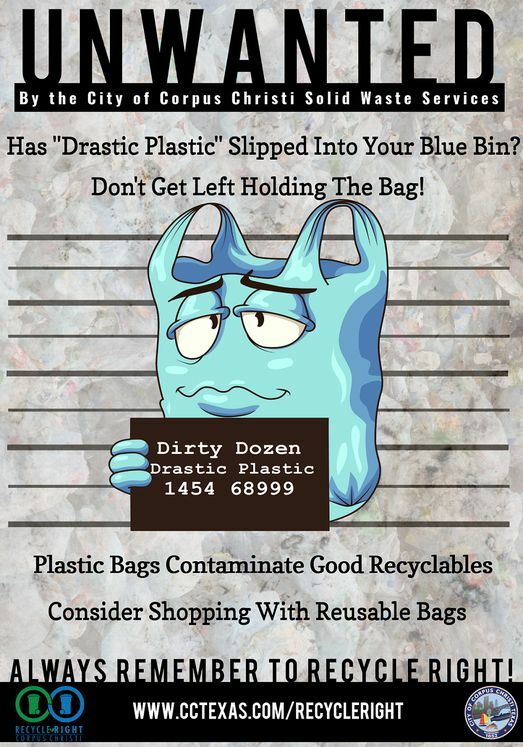 When placed in your blue recycling cart, plastic bags can contaminate other good recyclables and commonly get caught in the sorting machinery at the plant. For these reasons, plastic bags must be recycled separately. Clean and dry plastic bags can be recycled by placing them in designated drop off boxes located at HEB, Wal-Mart, Target, and Lowe’s and on the first floor of City Hall. More information about Solid Waste Services’ Recycle Right campaign can be found at www.cctexas/recycleright. Communities in Schools is also using the Recycle Right campaign to teach CCISD elementary students about the importance of recycling.